NOTE: PLEASE READ THE ENTIRE AD BEFORE SENDING AN OFFER. Here we go, this was just going to be a rolling frame project that I am selling to clear out the back work shop. Now I have gone and fitted all sorts of NEW parts on here and this is a cool deal for some one as i have a ton of parts on this machine and I am sure this will be right up someones alley. This bike is a Running bike but, it has it flaws and the price reflects that. Here is the scoop on the bike . The bike runs, but it needs motor work as I fired her up and after about 5 minutes of running, the head gasket has a leak, so that definitely needs sorting, but this has a frame adapter kit fitted so you can remove the motor from the frame really easy. So here is a list of parts on this machine, just so you can see the amount of cool stuff this has and i mean it really does have a TON of Brand new parts fitted. 2. powder coated rims with stainless spokes and new tires. 4. GT grips Original from 1974. 5. Polished front brake master cylinder. 6. Braided steel brake hoses. 7. New guilarri style hinged seat. 8. Freshly painted Gas tank with knee inserts. 9. New chrome Gas cap. 12. Fully Rebuilt Carbs with polished bowls and chromed tops. 13. New Genuine HONDA throttle Cables. 14. New genuine Clutch cable. 15. New Genuine Honda Speedometer Cable. 16. New genuine Tachometer cable. 17. New Custom 2.5 Speedo and Tach. 18. 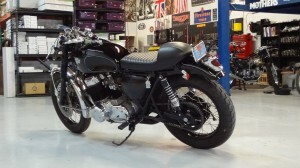 New British headlight with custom instrument lights. 19. Rebuilt and polished front brake caliper. 20. New polished brake and clutch lever. 21. Steel Bobbed rear fender. 22. Beehive rear tail light. 23 New Chrome turn signals. 24. New, non-maintenance battery with tender. 25. New 4 into 1 Yoshimura style exhaust system. 26. Powder coated oil filter cover. 28. Chromed gear shift cover. 29. Powder coated starter cover. 30 . New right hand handlebar switch assembly. 31. New Polished Alloy Battery Box. 32. Double disc set up and Rotors drilled. 33. New Positive battery cable. 34. Stainless Allen head Bolts through out. 35. Polished upper triple tree. 38. New 17 tooth front Sprocket. 39. New 48 Tooth rear sprocket. 40. Drilled and polished front sprocket cover. 41. New Genuine Honda intake Manifolds. 42. New stainless steel hose clamps. 43. Braided Black aircraft breather hose and filter. 47. Polished Allow front engine mount. 48. Braided Hose Oil Lines. 49. Original Bell mouth Velocity stacks. 50. New rear Brake rod and spring. 51. New rear brake light switch. 52. Finned rear wheel spacer. 54. New oil filter and New Bolt with check valve. 55. Polished Cam chain tensioner. 56. New throttle Body and polished embezel. 57. New Genuine HONDA intake manifolds. 58. Stainless Steel intake hose clamps. 59. Moon, Mechanical oil pressure Gauge. 60. New Knurled Clutch perch. 62. New gas cap lock. 63. New Genuine Honda petcock. A few thousand dollars worth of New parts alone on this bike, but as I said, the issue with this is 2 fold. (1) The motor needs to be rebuilt, she runs but head gasket leaks and not sure what else she may need but defiantly a rebuild on this engine, you could simply build another motor and swap all the new chrome and polished parts and fit in the bike and ride. (2) This motorcycle does not have a title, I never had one for it as this was just parts in the shop that I have put together, so you would get a bill of sale from me but no title. Now if this doesn’t sell, i shall simply build a motor and register and use as a shop bike, so no problem either way. But a cool looking ride, stealthy and a fun looking machine with heaps and heaps of new parts. I shall add photos and even a video of this running, so you can see and hear for yourself. This entry was posted in New On The Shelf and tagged Parts Bike.